32"x32"/80x80cm Cube Tent Softbox: Have a large removable front opening to allow for easy studio images in your home or office. Filter the light and eliminates reflections and shadows completely. 45.7cm/17.99" Light Stand: Made of Refined Aluminum Tube and Plastic Connector, this High-quality Light stand is the prefect item for the professional studio used. Reflective Aluminum Lampshade: Silver white inside design will improve the bright lighting output. Ideal for side, accent or background lighting. 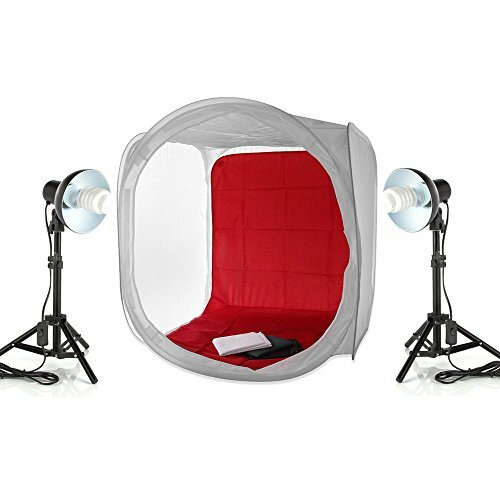 Work with photo tent and photo cube softbox. 45W E27 CFL 5500K Daylight Balanced Pure White Bulb Light: These bulbs allow you to do just that. Perfectly balanced to produce a 5500k daylight illumination means that you will spend less time worrying about colour balance in your images. Their energy efficiency allows you to work without worrying about the cost either. If you have any questions about this product by Run Shuangyu, contact us by completing and submitting the form below. If you are looking for a specif part number, please include it with your message.